Any standard ultrasound device can be equipped with an electromagnetic 3D guidance system (trakSTAR, Ascension Technology Corp., Shelburne, USA). The tracking system consists of a mid-range transmitter placed next to the patient’s head and two 3D sensors with 6 degrees of freedom (Model 800). The first (tracking) sensor is firmly attached to the ultrasound probe and the second (reference) is taped to the patient’s skin below the suprasternal notch (Figure 1). The tracking system is based on electromagnetic induction in sensor coils from the electromagnetic field generated by the transmitter and requires no direct visibility of its components. The system records 3D position and angulation of the ultrasound probe relative to the coordinate system defined by the reference sensor placed on the patient. The position tracking system has an accuracy of 1.4 mm and 0.5° (root mean square error) at a sampling rate of 80 per second. The only deviation from a standard ultrasound examination procedure is the requirement to attach the reference sensor and mark with the ultrasound probe three reference points on the breast – the mammilla, the middle of the inframammary ridge and the axillary part. These three points and the reference sensor constitute a normalized coordinate system for registration of the probe position. 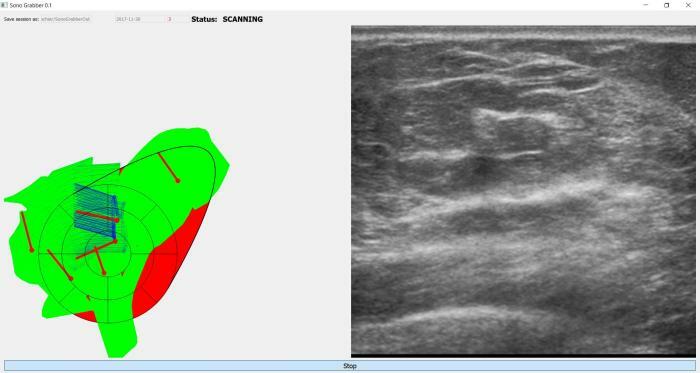 the ultrasound device on a PC using the PLUS open-source toolkit. The software monitors the orientation and distance of the probe from the reference sensor (e.g. probe pointing upwards or probe not in breast vicinity) and processes the ultrasound video to detect frames containing only artefacts (e.g. probe not in contact with skin). These time frames are ultimately rejected, thus allowing us to estimate the actual time in each position of the probe and monitor which parts where properly examined during the breast examination (Figure 2). The software package can be downloaded here. Please unzip the file to get the software installator SonoGrabberSetup.exe, run it and follow the installation instructions. The MD5 sum of SonoGrabberSetup.exe is 43f2e76b77caf64d20c9c6547902765c, the MD5 sum of the zip file is 585b22e3558811663eaebe263ca7e371. 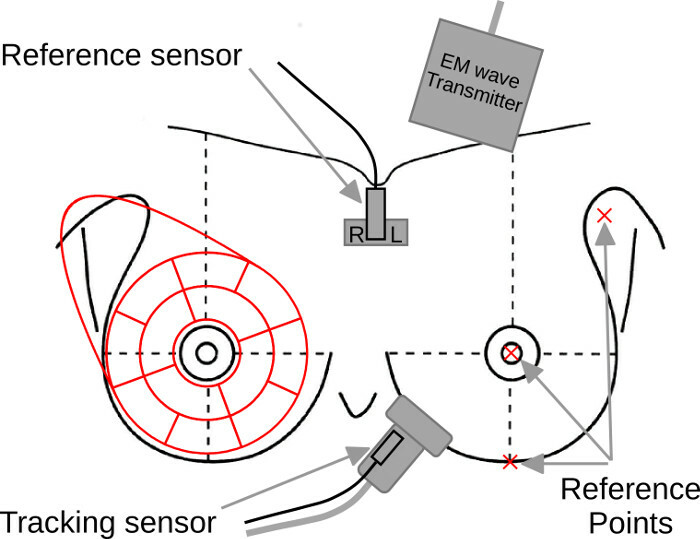 Figure 1: Experimental setup with position sensors and the location of three reference points (RP). One position sensor is attached to the sternum and defines the coordinate system. The second sensor is firmly anchored to the ultrasound probe. The electromagnetic (EM) wave transmitter generates the electromagnetic field. Figure 2: Application screenshot: monitoring coverage. Full description of the software in Czech can be downloaded here. The sofware was also used in the methodology for evaluating breast examination.